I completed another cover for my business card holder. This one I made using many different scraps of vintage linens. 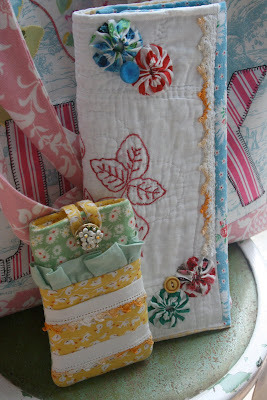 I used the same blue feed sack fabric I used on my "Junk" bag shown below. It goes with the bag rather nicely. I love using bits of this and pieces of that to create something functional. When I add the Ipod case that Renee sent me, I feel like I have a complete ensemble. What are you working on today? I just love what you've done!! It's all sooo very pretty!! :) Happy May to you! p.s. do you have a tutorial of how you made your bag?? LOVE it!! Oh..My is that not just the cutest thing....Would LOVE to see the inside of it.. When I saw your ipod case, I fell in love!!! How pretty in yellow. So pretty-- all of it! Sew cute! I love the yoyo's! I love using bits and pieces too. Just haven't had much time lately. Love your card holder and bag. Did you use a pattern for the bag? I need to look through my patterns. I think I remember having one that said Junk. Oh...I' finishing up 3 Roman shades today for a special order. Not the most fun thing to do, but it's what I do. I am up to my neck in grading school assignments, preparing for graduation, etc. 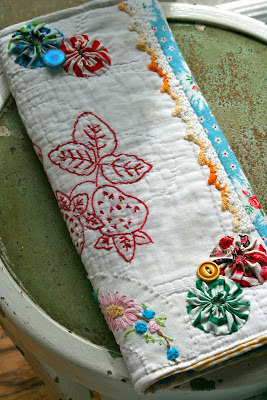 I can't wait for a little sewing. Have a lovely week friend. That is so cool Renee, what fun to see these lovely hand made items. Thanks too for visiting my blog. It is so nice to know someone is reading what I have to say, my way of creating at this point in my life. I used to do crafts when I was younger. Did you ever see drape dolls? I made many of them. I also made teddy bears and bunnies out of fabric, dressed them and customized them according to who I gave them to. It was fun. Oh Renee, how do I love this ensemble, let me count the ways!! The business card holder is just the cutest thing!! 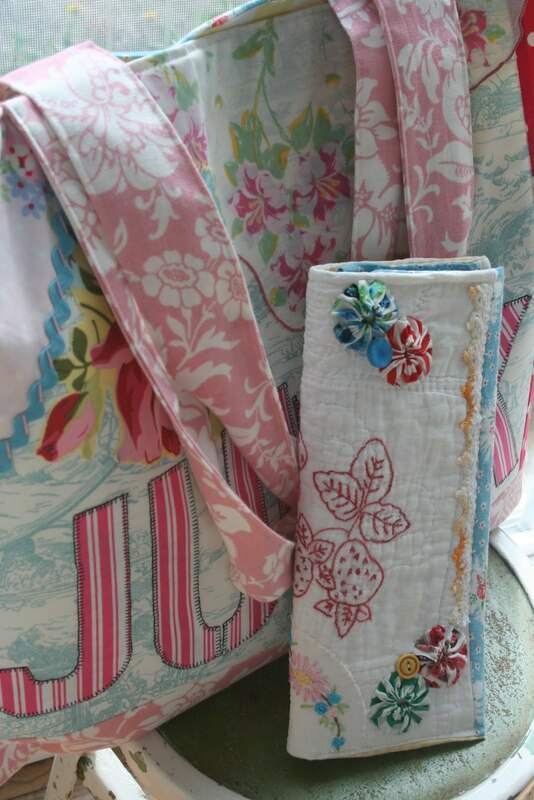 I love the mix of fabrics and embellishments...so clever. It all looks great together - nicely done!! Hope you have a lovely week, and I hope your Mother's Day was glorious!